I've been not posting on Wednesdays for the last two months but I feel like there's a lack of substance lately on this blog, so I'm going to add in a post here or there as necessary. It was a rough spring. I didn't get the jobs I was interviewing for and we weren't sure if Scott would stay active duty, Scott left for a month on short notice, and we went through a failed IVF cycle. That being said, there are always good things that come with the arrival of August and September. It's always been my favorite time of year. I was listening to a podcast about a former teacher who was in the classroom for 5 or 6 years and then quit to pursue something else. Her story is the story of many, many people. And she had a really rough start to her career. Over the last few years, I've met many first year teachers and some of them never came back, simply because things started rough for them and, with no positive prior experience, they had to move on. They knew no different. I had the best start to my teaching career. The best start possible. It was more than I could've ever imagined for myself during all those months of desperately trying to get a job in Pennsylvania (see: proof that God knew what He was doing). I worked in a wonderful school in Alaska with a very veteran staff. There was almost no turnover there. I got LUCKY. That position was made just for me. That's where I learned how to teach and I will be FOREVER grateful to those teachers and principals. There were rough patches (there's always rough patches) but I took away an infinite amount of positive when we left Alaska. What has kept me doing this year after year and what has kept me going back to the classroom is that I remember how ABSOLUTELY WONDERFUL my first job was. I remember how magical it felt. I even remember how much I loved every second of my student-teaching. Those are the reasons I keep going back. I know how much I love teaching kids and I love working with other teachers and I can't imagine what my adult life would be like without the relationships I've established with families and educators across the country. I mean, seriously, what a blessing. In fact...not trying to act like I'm doing some act of piety or godliness each day, but my teammate told me that she applauds me for just showing up each day after the year I had last year. It makes me feel good to know that I can take that love for teaching that I had 8 years ago and still show it to people today. Allllll that being said...there are some very good things about going back to the same school and the same classroom this fall. 1. I already know a lot of the kids and families in the building. 2. I know what to expect. There won't be big surprises when it comes to what is expected of me and my teaching. 3. I get to continue working with a great team. Part of what made me realize I had to go back was that I get a lot of support from the teachers I work with. Going through IVF, I had a lot of help and support from other teachers...my teammate helped close out my classroom for me, for example, because I was out sick for the last week. That's dirty work and that kind of support is priceless. Other teachers covered my class for 15 or 20 minutes in the mornings while I was at appointments. Teachers just do these things for each other, no questions asked, and I'm so grateful to be in a profession where no one is ever really out for themselves. It's not about us. 4. I know what I'm doing. If I count student-teaching, this is my 8th year in 4th grade. After many years at the grade level, I look at each new one as an opportunity to expand, tweak, and perfect what I'm doing. It's not guesswork, it's finishing-work. 5. I'm grateful to have the opportunity (period) to teach another year. With this military life and with this profession, at times, another school year isn't always guaranteed. When Scott asked me why I wanted to go back, my only response is that I love teaching too much not to. He has always left me working up to me, which I appreciate. And, trust me, I'm not normally the optimistic type. We have a WHOLE LOT of things up in the air right now and, out of all the things I can stress out my pessimistic side over, teaching isn't one of them right now. This is the aspect of life I can feel settled with, so I'll take it. 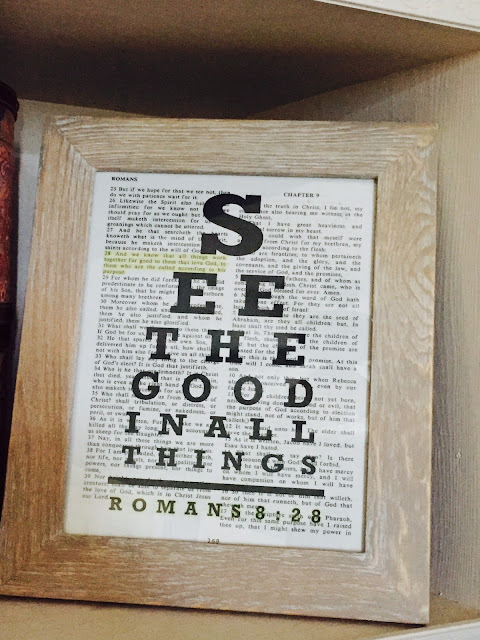 I love the subtle reminders to see the good in everything around you. I love that you had an amazing start to your career. It left passion in you and that is something that is hard to find these days. I grew up in a military family and my mom didn't work. Sometimes I wonder if she regrets that now. She has no real career. She just works to pay the bills. Thanks for sharing! It seems like you're a great teacher and your school community is lucky to have you. In working adjacent to the education realm, I am seeing how much poor teachers can affect students and how it definitely takes a special personality to figure it out, especially in those first few years. I hope you have a room full of great students with sane parents and continued success with your team! And for all that non-work stuff - fingers crossed for smoother sailing ahead. I agree that it's important to see the good in situations. I love that you have had such amazing support from your fellow teachers through everything you have been through. Nothing can replace that feeling of community. It's hard to see the good sometimes--especially in teaching when there are days you want to just give up--but it's so important. That print is awesome! when life gets you down, it's important to look at all the good we have around and in our lives. i love that print. Love your Etsy find - so cute! You rock & you'll have a great year! Been with you on the sidelines watching and listening since Alaska ,you are doing a great job in all that you do and a great support to your husband. Praying for you and your family now and to be. I definitely think about doing something else from time to time. Teaching is HARD. Teachers are not appreciated or respected all too often in today's society. Demands increase and time is decreased, but yet, I do truly love it. And that's why I keep coming back.